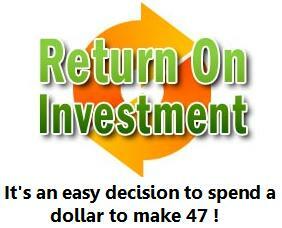 BuildIT Blog | BuildIT - Return on investment is a "no-brainer"
When was the last time you "wasted" money on something? You took some hard earning money, bought a widget that ultimately gave you nothing in return, other than the initial feeling that you may get something out of it at some point. OK, now that I've re-opened a wound, let's cut to the chase. Everyone comes to BuildIT looking for one thing - a solution to a problem. Finding the right solution will put money back into your jeans, or time back into your life, or will reduce the stresses of running your business... or if you're lucky, ALL 3 at the same time. You part with your hard earned dollar to subscribe to BuildIT; mentally you are doing the math - the "what's in it for me" equation. You need to see a major return on investment, and you need to experience that return (make it yours) right out of the gate. It's the story of many of our customers... and it can be your story too !! Let's look at ways you can win with BuildIT. Every job you do requires a number of tasks, and responsibilities from other parties. The more tasks required, and the more people involved, the more mistakes will occur. Those mistakes generally are caused by miscommunication of some sort. Communication issues are the main cause of grief, and profit loss. This is an undeniable fact. Ask yourself, where do problems occur that cost you $$ or time, and chances are, you'll attribute that to a breakdown in communication. BuildIT is the perfect solution for keeping you and others "on track". Any and all issues are documented in one place, tied to the job. There is no mistaking who is responsible for what, who said what, what was to be built and when - all that information IF YOU TAKE THE TIME TO ENTER IT, is in one place, and there to serve your interests down the road. Scott Sedam of True North Consulting, an advisor to high volume homebuilders, claims from his organization's research that for every residential construction job, there are about 30 - 35 subcontractors and vendors. There is typically one mistake that takes place for every 5 outside people involved in the project, so you can expect 6 - 7 mistakes per job. These mistakes, thanks in large part to miscommunication (not getting the information in time, red lined drawings that are unclear, building off outdated specs or schedules, etc.) WILL COST YOU time, money and aggravation. And the dollar cost will be well in excess of what our typical customer would pay for subscribing to BuildIT for a year. Use BuildIT properly (even minimally), and you will reduce errors, and have a back up that protects your interests should errors occur, and passes the onus of responsibility on to the other party. Think about what it costs you for a part time or full time "warm body" to help with the "administrivia" of running your business. Now imagine a full time office assistant that never calls in sick, is available 24/7, does not give you "attitude", does not spend hours you pay this person each month checking Facebook, Twitter, playing Solitaire, checking CNN's latest headlines, etc., does not contribute to shrinkage, does not increase your risk of embezzlement - and you get this for a whole month, at a fraction of the cost of that "warm body" (perhaps, 1 to 2 hours' wages of that person's time and loading) !! Our customers make this claim that BuildIT saves them $1000's per month in wages. I calculated with one customer in Texas that his return on investment with BuildIT was 47 to 1 - think about it - for every $1 he spends on BuildIT, he saves $47. Do the math. Having said this, we recognize that you do need adequate levels of staffing to run your business effectively, and office administrators do play a vital role in the operations of many small to mid sized contracting businesses. BuildIT can augment your business, assist your team with becoming more organized for success, and even give your office administrators a tool to help them accomplish their tasks quicker and with less error. Each person knows where to go for the information, where to post the information, and this will free up your staff to do more valuable functions that drive your business forward in terms of professionalism and profitability. We have customers who use BuildIT to their advantage - to get new business. Simple. You're competing with other companies offering a similar product. Your price may be in line with theirs. What distinguishes you from the other guy? If you use the worn out platitudes like "we're honest", "integrity in everything we do", "unsurpassed customer service", your customers will blow right by. You need something that truly sets you apart. Professionalism - customers want to do business with someone that looks good, and gives them the "feeling" that they're dealing with the pros. You use the many construction document templates in BuildIT, which can be printed off, or emailed, showing your letterhead and all the details. AND, you let them know about a system that will keep them informed 24/7 about their project, where you are at any point in the schedule, and a place where they can view any files pertaining to the job. "Mr. Future Customer, if you choose us, we have a web based service that will allow you to view your project schedule at any time of the day. Through this system, you can see how your job is progressing, and you can even communicate with us on any particular task on the schedule. I will also post files for you to review - contracts, specifications, progress reporting, pictures - anything that you need to see along the way will be available through this service. There is no website to remember, no username and password to maintain - just check your email and I'll send you a link." All things being equal, by you offering this service, you are now set apart from 95% + of your competitors who haven't yet graduated to web based construction tools like BuildIT. Have you ever calculated what your time is worth, per hour? Have you ever calculated how much time you would save on each project if you carved off, say, 5% of the time? Time is money - do the math. And start saving time today by using BuildIT. Take the time saved and invest it in new business. New business = new revenue = increased profits for the year. Do this, and then call us with your answer so we can brag even more about how BuildIT contributes to our customers' bottom line. In short, you're not here to buy technology because it's cool (although, we admit, it is a cool tool). It HAS to either save you time, make you $$, help you avoid embarrassment or costly call backs, or help you get the next job and have a leg up on your competition. Put it to the test today - we'll partner with you, and help you get some success under your belt.